This picture comes from Wes Roberts. 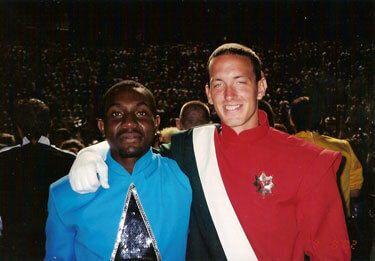 This is me and my best friend, Damien Gaiters, at the ageout ceremony during the 2002 DCI World Championships in Madison, Wis. We marched together in college (JSU Marching Southerners) and aged out together. He was my best man, and now we are both fathers and Georgia music educators supporting Drum Corps International. On a side note, because of my fond memories of Madison, my wife and I recently named our new baby girl Madison.